This is Manure Depot’s Manure Store for the Manure Mavens and Moguls who want to grow great food in urban settings far from the ranch or farm. Growing food is an important activity and good home grown food is possible no matter where you live. We provide access to manures for teas and direct applications to your vegetable and herb beds. 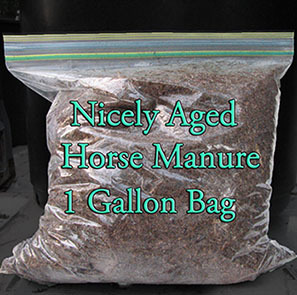 I have Worm Castings, and nicely broken down horse manure from a stable that uses a fine cut pine shaving for bedding. It makes a nicely balanced soil for growing plants. If you can’t wait email me at adina@manuredepot.com. 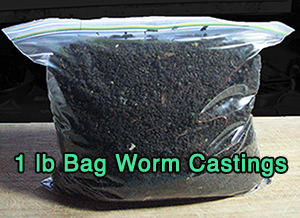 Worm Castings (worm manure) are the black gold of organic fertilizers. Super rich in slow release macro and micro nutrients and minerals. Plants fed this natural fertilizer will thrive. I harvest these castings from my worm composters. My worms are fed vegetable wastes, and bunny manure, and supplemented with minerals. Castings are not harvested until all of the wastes are broken down. They are not mixed with any other substance, but are 100% pure worm castings. Mix into potting soil at 10 to 20% . Top or side dress plants in pots or in the ground, or mix with water to make liquid fertilizer tea for orchids or seedlings. The buy now links have been temporarily disabled because they are not keeping up with the cost of shipping. If you want to buy worm castings or nicely broken down horse manure please contact me directly at inkadina@bellsouth.net, and I will let you know the current price for domestic shipping on these products.